An alcoholic beverage, distilled from fermented grains and aged in wooden containers. Whiskey is made in many countries such as Ireland, the United States, Scotland, and Canada. Whiskey from Scotland is known as Scotch. 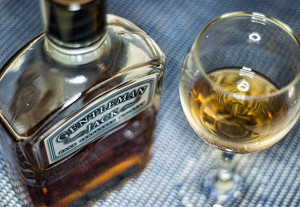 "Gentleman Jack Rare Tennessee Whiskey" by Wendell is licensed under CC BY-NC-SA.